Once upon a time, there lived a beautiful princess who wasn’t afraid to cheat, deceive, seduce or murder anyone who got in her way. I like these kinds of books—collections of short bios of (mostly) unknown women who are remarkable for doing daring/unusual things down through history. I have one on women at sea; several on women warriors; others on women explorers, mathematicians, and scientists. They generally follow a pattern of one to two page biographies written in a breezy, modern style emphasizing the outrageousness (for her time) of the woman’s actions. Why do I like these kinds of books? To be honest, they’re snack food—light fluffy reads that give me a break from heavy turgid research books. They also remind me that—despite what the history books tell us—some women of every age, somewhere in the world were doing remarkable things. The majority (like today) lived ordinary lives, but a few women always stood out and lived extraordinary ones. I like learning about them and being inspired to tell their stories. This kind of book is a good starting point for any historical novelist looking for inspiration. 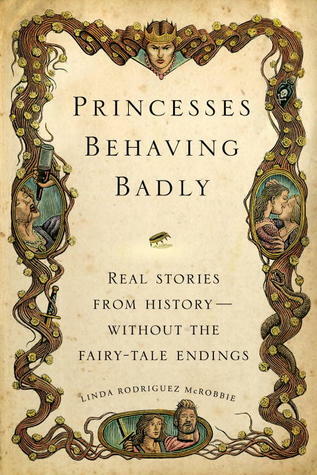 So how does Princess Behaving Badly stack up? Very well. Some of these kinds of books are little more than gimmicks or novelty books, best known for their wretched research. McRobbie provides substance and obvious research with a modern voice. She divides her book into several categories: warriors, usurpers, schemers, survivors, partiers, floozies, and madwomen. In each section she highlights three to five princesses (thirty in all) with lengthy bios (four to six pages each) and frequently gives several other princesses a page or two in a side bar. When Roman princess Justa Honoria Grata found herself about to be packed off to some backwater to act as the docile wife of a yes-man in service to her brother Emperor Valentinain III, she sat down to write a letter. To Attila the Hun. Seeking help from Rome’s worst enemy didn’t endear her to the emperor. And it didn’t exactly solve her problem, either. But if the emperor thought his sister would take de facto banishment gracefully, he’d obviously forgotten who she was. McRobbie then backs up and does an excellent job of filling in the history and politics of Honoria’s life in relation to her emperor brother and equally interesting strong-willed mother (Galla Placidia, the protagonist in my novel Twilight Empress). It was a complicated time with few primary sources and some scholarly disputes over the details; but the author gets it right on almost all counts. In other sections she points out what are generally accepted myths and what more modern historians believe to be true about her subjects. McRobbie did her homework. My only problem with the book is that my copy is a free ARC (advanced reading copy from uncorrected proofs won in an Early Reader Program at Library Thing) and contained several typos, missing words and a couple of continuity errors. (On one page the princess was both raven-haired and red-headed.) I hope those errors are picked up in the final edits. My copy was also missing the “Introduction” and all the back matter (bibliography, index, acknowledgements, and about the author) which enhances a book and makes it valuable for research. I guess I’ll just have to buy the finished book for my research shelves. Enjoy! This sounds entirely fun. Good to have had it “fact checked” by you in advance! I was given this as a Yule gift, and as you say, it was like mental chips and dip! Only issue I had with it was her eye-catching title about badly behaved princesses as an anti-Disney theme. But some of her princesses only behaved “badly” if judged BY Disney-esque standards; so it had a strangely back-handed feel to it. I liked the “Punk Princess” the best — and she really didn’t behave too badly at all.